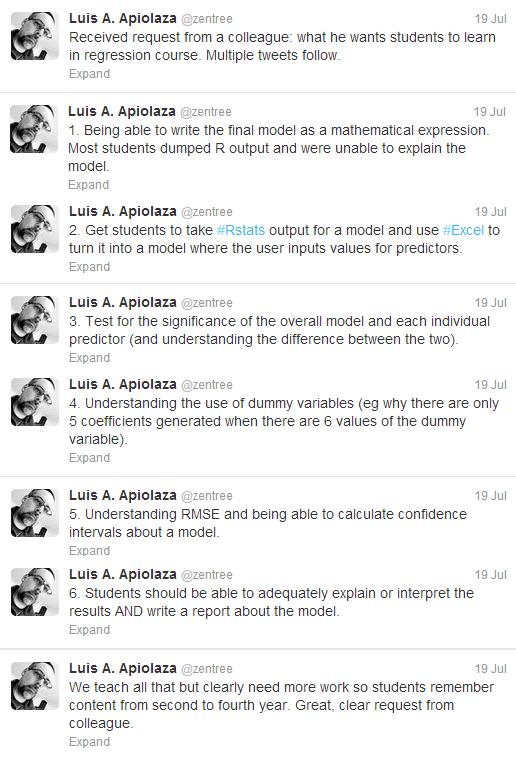 On Twitter yesterday, Luis Apiolaza shared some tips that he’d given a colleague on what students should learn in a regression course. These are pretty great, so I thought I’d include them as a post here (mostly because that’s useful for me, but also because it’s as if I’ve written a blog post when all I’ve done is screen-grabbed some guy’s twitter feed). Luis is a quantitative geneticist and lecturer at the School of Forestry in Christchurch, New Zealand, wrote the ASReml (and ASReml-R) cookbook, runs the excellent Quantum Forest blog that has a general theme of data analysis, is good at the twitter, and – to quote Justin Bieber’s most recent analysis of Bill Clinton – is a ‘#greatguy’*. * Coincidentally, I also had a turnaround of my views on Apiolaza after video emerged of me exiting a computing lab with a group of unruly S+ users, urinating into a paper recycling bin, spraying cleaning fluid onto a print-out of the ASReml cookbook, and shouting ‘F*ck Luis Apiolaza!’.